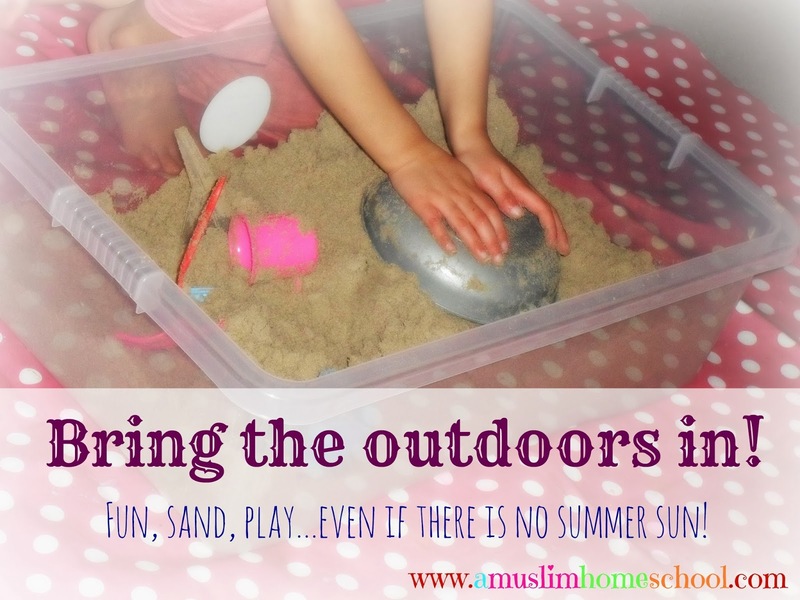 a muslim homeschool: Indoor sandpit for winter-time fun! I was speaking to a sister a couple of weeks ago about what I could try to keep my younger one busy. She suggested playing with sand! My first reaction as I mentally processed this idea was, what about the mess! There will be sand everywhere! But as I pondered, and she shared what a benefit sand playing could be to help improve concentration and not to mention the "quiet" as she is busy playing away, I figured she would love it! I already had a large container box, so that weekend we got a bag of sand (which was only a couple of pounds!) and put in a few little toys. We place a mat under the box so if sand spills it is easily picked up and thrown back in! I have to say, it keeps both girls busy for a long time! ....and that gives me plenty of time to do something without feeling guilty I'm occupied with something! I'm trying to find more fun activities to keep the kids busy......what do you your kids do? Leave a comment below because I really need more ideas! If you can find a box / container large enough for the kids to play, but small enough that can be hidden away somewhere...under a sofa, in a cupboard maybe? The box I used was only around 20cm high perhaps. First of all I love your blog. Thank you for the awesome ideas you share and especially the free printables you generously share.